Farah Farazad is a visionary woman leader impacting the industry by storm, through her global brand BACK 2 BUSINESS. 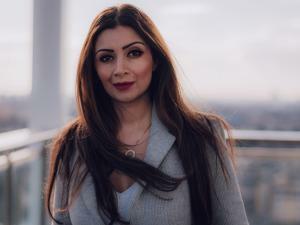 LONDON, UNITED KINGDOM, January 18, 2019 /EINPresswire.com/ -- Farah Farazad is revolutionising networking on a global scale through her international award-winning brand BACK 2 BUSINESS1 Joint International Trade Networking. Recently awarded the Council of British Chambers of Commerce in Europe (COBCOE) International Trade Award, for successfully exporting its brand around the world, including diverse markets such as Cuba, Colombia, Mexico, Turkey and Romania. The events positively impacted the economy and even was an official event of B20 Argentina 2018, hosting government officials in Buenos Aires. Farah Farazad is a visionary leader impacting the SME industry by storm, through her global brand BACK 2 BUSINESS. She has innovated business networking and has big plans for revolutionising new accessible ways for businesses to trade around the world. BACK 2 BUSINESS is a fast growing network of business professionals from all over the world. Not only does BACK 2 BUSINESS provide an engaging platform, it brings together the international community in each host country to share and promote trade and investment opportunities. Having hosted Ambassadors, Ministers and be an official event of the B20 Argentina in 2018. She is a role model to other woman entrepreneurs, leading the way for women to not be set back in their visions and influence positive change in the world. She runs a successful production company, Farazad Productions LTD2 headquartered in London, alongside BACK 2 BUSINESS and has created a fun interactive working environment for the team. She strongly believes in empowering individuals and mentors several striving professionals. In 2018 she spoke at to the Young Professional Network in London, motivating young business professionals to get out there and network with others, sharing key advice of how to overcome shyness and make a lasting impression. Farah is no stranger to working in a male dominated environment, whilst living in Dubai she was an Underwriter for one of the largest Insurance Companies, underwriting multimillion-dollar risks. She also volunteered her time as a Board Member, for the British Business Group (BBG) where she served a 5-year term. In addition to this she was the Chairwoman for the Insurance Focus Group for the BBG and also sat on the committee as the Event Director for ‘Women in Insurance - WII’, a Non Profit organisation connecting professional women in insurance in the UAE. Farah moved to Istanbul in 2012 and was a Senior Advisory Board Member for the British Chamber of Commerce in Turkey. Her invaluable knowledge was key to the Chamber in Istanbul and she organized bespoke events on their behalf, introducing her own brand BACK 2 BUSINESS, which gave the Chamber acclaimed and award winning recognition in Turkey and Europe, the Chamber was Awarded by the Council of British Chambers of Commerce in Europe (COBCOE) for ‘Event Management Excellence’ in 2014 for the BACK 2 BUSINESS Brand. Farah is a strong advisory in supporting charities and often donates her time to assist with helping projects that benefit incredible causes. She is regarded as a philanthropist by many, not only does she dedicate full resources for the welfare of others, Farah commits to making a difference to the causes. Farah announced she will implement a special category within the BACK 2 BUSINESS platform, called Global Impactors, that will provide a global audience to special causes that are committed to making a change in the world. The platform has a niche market within the industry and is set to transform current issues and obstacles encountered with online networking today. Farah is definitely a leading woman that will make headlines in 2019, her brand BACK 2 BUSINESS is set to better business for thousands of companies. The Global Tour is expanding its reach to cover six continents by 2020, having already achieved three continents and adding two more in 2019. BACK 2 BUSINESS will celebrate their 10th year anniversary of the brand in the Antarctica in 2026, covering all continents, the best is yet to come.